Why clean a façade? The most obvious reason is to improve the aesthetic appeal of a building. Haven't you ever looked at the facade of a building and said to yourself, "Who in their right mind picked that awful greyish brown brick color?" Chances are, that isn't the brick color, it's years of dirt and grime buildup from city pollution. Underneath that layer of buildup is a facade that is waiting to shine. 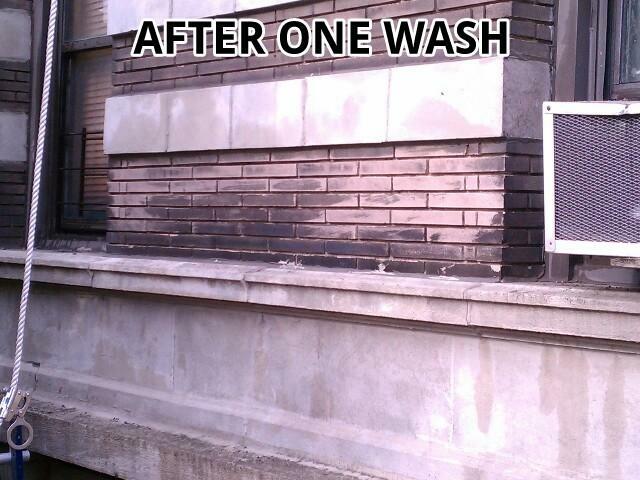 There is no denying that remove years of dirt and grime will transform the exterior of a building. However, there are many other, more significant reasons that building owners should consider façade cleaning. To begin with, exposing the substrate of a façade can allow contractors and engineers to better evaluate the structural stability of the masonry. Often, layers of dirt and grime can make it impossible to accurately gauge what repairs must be made to a building. This can lead to a building either underestimating what needs to be done, resulting in continuous problems that are never fully addressed, or overestimating repair work, leading to expensive and unnecessary construction work. 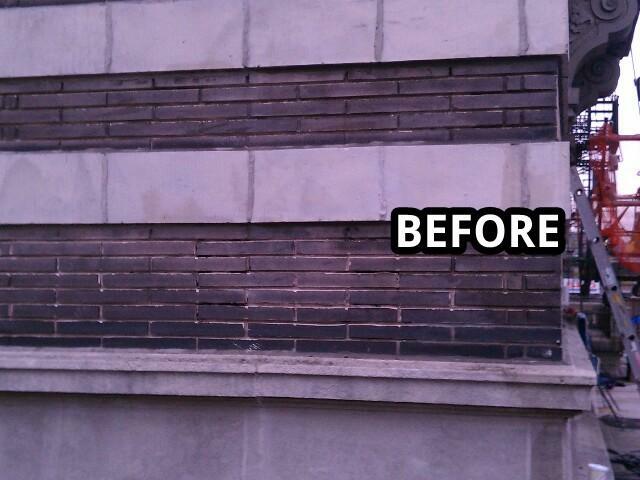 Not only can cleaning the façade expose masonry flaws, but it can also help prevent more. 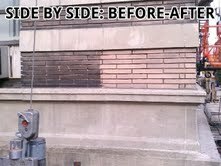 Façade cleaning helps to remove damaging pollutants, such as those found in acid rain (sulfer, nitrogen oxides, etc. ), that would otherwise accelerate façade deterioration. The primary cause of masonry decay is moisture. When moisture is coupled with soluble salts, like those found in acid rain or in the hazardous pollutants of urban atmospheric gases, this masonry decay is accelerated. These elements can sometime combine to form corrosive liquids such as carbonic acid or nitric acid, which can undermine the stability of acid-soluble cementing binders that hold the façade masonry together. 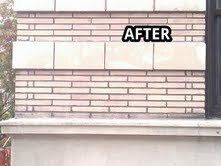 Façade cleaning also removes heavy surface deposits that contribute to the progressive decay of stone, masonry and concrete surfaces. 1. When will the cleaning take place? 2. What method of cleaning will occur? 3. How much cleaning will be done? When will the cleaning take place is a two-fold question: it encompasses both the time of year the work will commence and if the cleaning should occur before or after other repair work. The time of year the work will occur is extremely important, because some cleaning methods need to occur when there is no chance of freezing or accelerated drying. For example, all water-based methods need to occur when there is no threat of freezing while the work is being completed and for several weeks after. This is because saturated masonry takes several weeks to dry. Additionally, some chemical-based cleaning products can’t be applied when the temperature is too hot, because it will accelerate the drying process and the chemicals may not have enough time to work properly. For larger buildings, the project may need to be broken down into sections, and done over more than one season in order to accommodate for weather conditions. Determining if the cleaning should occur before or after other repair work is a little difficult, as there can be a lot of guesswork involved in the decision. Normally, it is more ideal to clean the surface prior to other repair and restoration work, since removing the dirt and grime will make it easier to determine what repairs need to occur. Also, it is better to repair or patch a clean sound surface than to patch over the dirt, therefore trapping it in the masonry. However, as some cleaning methods (such as water cleaning and abrasive cleaning) can exasperate existing masonry problems (like waterproofing issues and deteriorated mortar), it may be better to address these problems prior to cleaning. This is something that the contractor or engineer working on the project will have to consider before scheduling the work. There are three primary categories for façade cleaning projects: chemical, water, and abrasive cleaning. However, some projects may require a combination of methods. For example, you may need to begin with a non-chemical water soaking to remove the upper layers of dirt and grime and then use a chemical cleaning agent to remove the heavier staining of the bottom layers. Most chemical methods are used on urban buildings with extensive staining, often the type with heavy amounts of grease and other buildup. It is important to note that, which the term “chemical” may imply hazardous materials, not all products in this category are dangerous. Even something as harmless as dish soap is categorized under chemical cleaning. These products work by dissolving the stains, and allowing them to be easily rinsed away. There are for different types of chemical cleaners: acidic, alkaline, organic solvents, and special non-sudsing detergents. The contractor or engineer assigned to the façade cleaning project will examine the masonry materials that need to be cleaned, and determine the safest and most effective product. There are two main non-chemical water based façade cleaning methods: water soaking and pressure washing. In water soaking, a slow steady stream of water is applied to the façade in order to loosen and wash away the dirt. Often, this is followed or accompanied by hand scrubbing with brushes. This method is effective on all different types of stone and brick. However, there are drawbacks to water soaking. As mentioned previously, if the building has waterproofing issues that have not been addressed, there is a high probability that water seepage will occur and interior surfaces will be damaged. There is also a risk of erosion of the masonry due to the continuous cascading of water. Furthermore, water runoff must be controlled and disposed of properly. Abrasive cleaning is the most invasive of methods, as it deliberately removes the outermost layer of the masonry or concrete façade, as opposed to simply washing away the stain. Grit blasting, wet sandblasting, and sanding belts are all examples of abrasive façade cleaning. While the method is effective, it has a number of limitations. To begin, methods such as grit or sand blasting can damage the mortar joints and increase the amount of pointing needed after the façade cleaning project is complete. Additionally, this process can undermine the softer substrate below the outer layer, leading to a more rapid deterioration of the façade as a whole. This method should only be used if the building has performed proper spot testing to ensure it will not damage the façade. While it is recommended that the entire façade be cleaned in order to properly expose any maintenance issues as well as preserve the overall stability of the building exterior, time and budget do not always allow for this. Many buildings choose only to clean the front façade, or only the first few floors, in order to keep the price within budget. For buildings with storefronts, consideration needs to be made for the removal of awnings, and the potential temporary closing of entrances while work is being performed. These additional considerations may increase the cost of the work, and should be factored into any proposals you receive. Most contractors are willing to include this, as well as provide alternative pricing to complete a section of the building as well as the whole, so that the building owner or board can make an informed decision.